We're currently oh hiatus from the comic. Us three artists were at one time living in a central location, but life has thrust us to different parts of the country. If all goes well, in six months or so we will be back with more of that Condensed Vibration freshness. We're coming to the end of Chapter 2! Thanks to everyone who's been stickin' around! There may be some changes coming soon, stay tuned! Check it out! 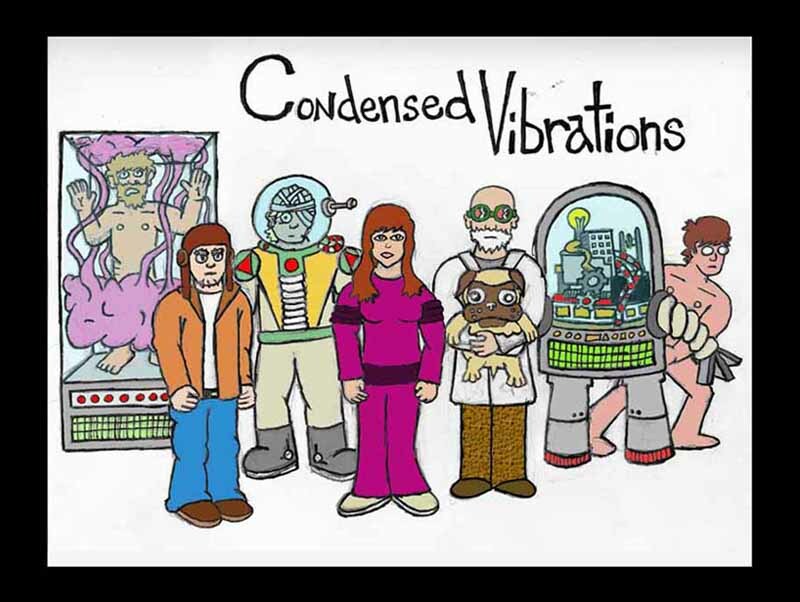 I made the first chapter of Condensed Vibrations into a film last summer. just YouTube condensed vibrations! Check it out, for all of those who thought that only big budget movies were centered around ruining the things you love, it turns out, indie cinema is just as prone to bastardizing the one thing you hold sacred. For a low, LOW fee, you can see cheap adaptations of your favorite webcomics. See how the corpses-turned-actors dribble their lines with delicacy. Taste the failed potential in each scenery chweing monologue! Marvel at the cg pug that will melt your heart with so much binary!